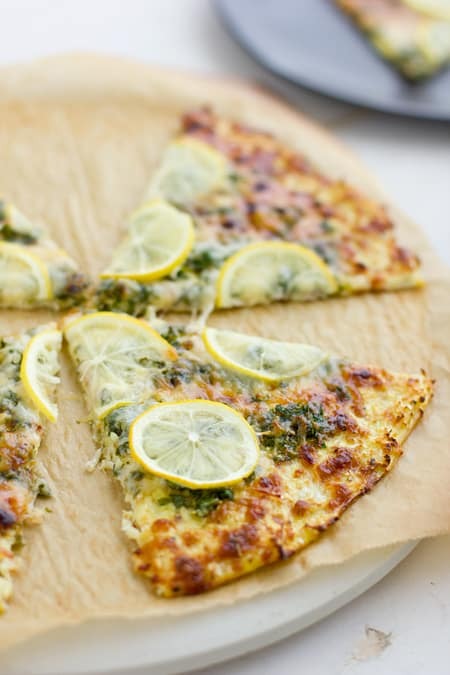 Cauliflower Crust Lemon Gremolata Pizza - Oh My Veggies! I am so tardy to the cauliflower crust pizza party. I’ve been reading about this magical pizza crust for years, but until a few weeks ago, I had never tried it myself. So I sought out the original cauliflower pizza crust recipe and gave it a go. It looks almost like a giant omelet, right? Chris and I both liked the crust, but in a different way than we were expecting to like it. I guess I thought the cauliflower would transform into something more bread-like after baking. It does not. It’s a lot flatter and thinner than a traditional crust, although you can pick it up and it stays together. And then since I was already feeling adventurous with my fancy new pizza crust, I thought I’d try topping my pizza with lemons. Yes, lemons! I had seen it done a few times and my first reaction was revulsion. Lemons on pizza? That is wrong. But I love lemons and the idea kind of stuck in my head. Could lemons really work as a pizza topping? Well, the secret is to slice them really thin–almost shaved. That way, you still get the tartness of the lemon without it completely distracting from the rest of the pizza (or being tough to bite through). I wouldn’t use it on a pizza made with tomato sauce; this particular pizza was inspired by gremolata, which is a combination of parsley, garlic, and lemon. I used the parsley and garlic combo instead of a sauce, added some parmesan cheese, and then topped the whole thing with the thinly sliced lemons. So tasty! Lemon is now up there with pineapple and green olives on my favorite pizza topping list. If you don’t have the time or desire to make a cauliflower crust, this would work on any thin pizza crust, store-bought or homemade. 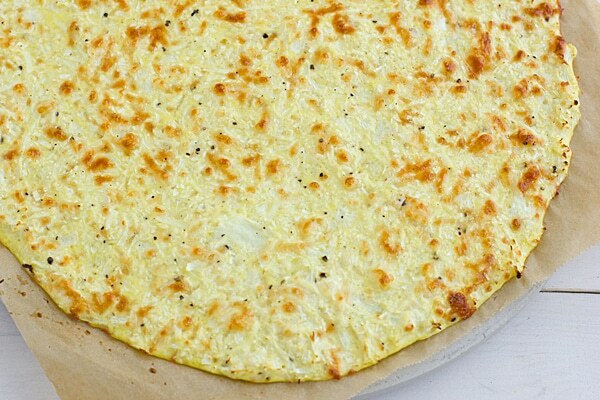 But if you haven’t tried the cauliflower crust yet, you really should (whether or not you top it with lemons). This post was originally published on April 25, 2013. 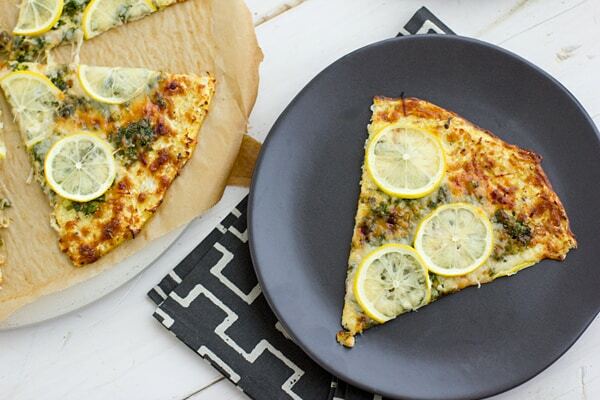 A cauliflower crust makes the perfect base for this gremolata-inspired pizza. Combine parsley, garlic, and olive oil in a small bowl. Sprinkle mixture onto pizza crust, leaving a 1-inch margin around the edge. Top with cheese and lemon slices. Bake 8-10 minutes, or until cheese has melted and lemons have softened. The only thing I don’t like about pizza is a big heavy crust, this looks perfect! I made a lemon topped focaccia the other day which was fantastic, so I know I would love those lemon slices. This one was really sturdy–much sturdier than expected! It held up to me moving the slices around for photos and we picked it up and ate it with no problem. I’ve never heard of cauliflower crust. I’m going to have to try it. Not sure I could do lemons though! I’ve wanted to try that cauliflower crust too – I hate to be tardy to the party! So thanks for finding the original source. You are brave with lemons! It is good! And pretty kid-friendly too, I think. It doesn’t taste like cauliflower! That looks amazing. So you keep the lemon rind on the lemons? Yes, you keep it on! 🙂 Since they’re sliced really thin, it’s not like chewing on a big piece of lemon rind. Which definitely wouldn’t be very appetizing. Absolutely perfectly yum. Cauliflower pizza crust – what a ridiculously original idea! I love the lemon slices – I’d imagine would be deadly delicious with parmesan. And thanks for introducing me to yet another great blog! I keep wondering about cauliflower pizza crust. I wonder if I could make it and not tell my family.. This looks incredible. I love cauliflower crust! i’m intrigued. this has made me want to give the cauliflower crust thing another shot. and lemons. i love lemons. thanks for the inspiration. This may be my favorite recipe so far….LOL….all your recipes are my favorite so far, because you come up with the most creative ways to prepare meals. My niece saw this on on facebook and thought it was the bomb! I just overdosed on cream so something sharp and tangy sounds just yum. I’ll have to give her crust a try. You are spot on about it not being very bread-like but still filling and a good homage to a traditional pizza crust. I love the non traditional pizza toppings. I need to try the thinly sliced lemon. I make pizza all the time and I rarely put tomato sauce on it! There are way too many other possibilities out there. 🙂 If you try a vegan cauliflower crust recipe, let me know! I tried coming up with my own and it didn’t work out so well. I’m fascinated… I’ve never heard of a cauliflower pizza crust! It looks really good. Damn girl.. You have the most creative food mind!! Love it. I am making this for sure. Has anyone tried freezing this type of pizza? I wonder if it’s possible to make and then freeze individual servings. I prepare a lot of meals for my disabled sister and this looks like something she would enjoy. You might want to try asking this on Your Lighter Side. She has much more experience working with this crust than I do! This looks really good – and I don’t even like cauliflower! Have mercy! That looks so good. Saw this post and had to make it. So delicious! Thanks for the great recipe! Would NEVER think to use lemons!